A Surprising Take On Famine In Alex De Waal's New Book 'Mass Starvation' : Goats and Soda Maybe you've heard that world hunger is at crisis levels — and climate change is largely to blame. A new book argues otherwise. 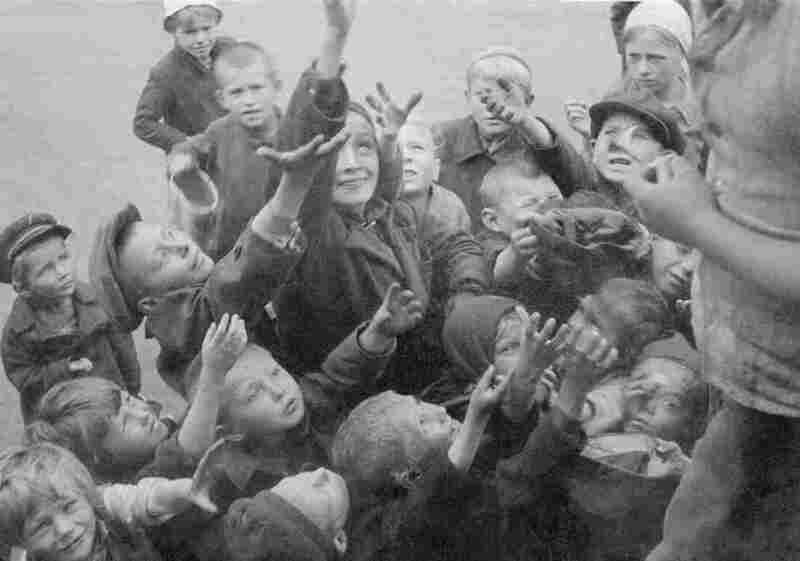 Russian children clamor for food, circa 1941. During World War II, the Nazis sought to implement a "hunger plan" to starve millions from Russia and Eastern Europe. A new book offers a surprising perspective about the hunger crises dominating the news. The author, Alex de Waal, a professor at The Fletcher School at Tufts University, is an old hand on this subject. For three decades he's been writing about famines — and in several cases assisting with the response. 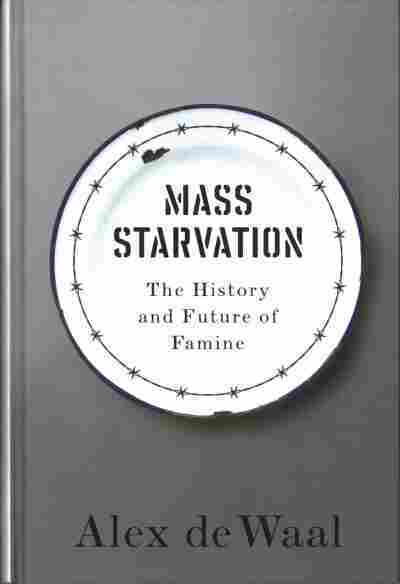 But in an interview with NPR, de Waal says this latest take — the book is called Mass Starvation: The History and Future of Famine — marks an evolution in even his own thinking. As bad as things are now — they used to be so much worse. The past year has been unquestionably terrible, notes de Waal, with famine or near-famine conditions putting millions of people at risk of severe malnutrition and even death across Somalia, Sudan, Syria, Nigeria and Yemen. But de Waal says the current situation still represents a relatively small deviation from an overall trend of enormous progress. "If we look at the history of famines over the last 150 years, what we see is that about 100 million people died in famines globally over this period. And almost all of these — 95 percent — died in the 100 years up to 1980." Among the most severe of the historical famines were a wave of mass starvations in the 1870s and 1880s — later collectively dubbed "the late Victorian holocaust." These, says De Waal, resulted from colonial policies imposed by Britain and other European powers on India, China and to a lesser extent parts of Latin America and Africa. For instance, says de Waal, when the British began their involvement with India in the late 17th century India had a bustling textile industry. But by the early 19th century the British had largely quashed it by placing prohibitive tariffs on cloth produced in India. Instead raw cotton grown in India was shipped to the U.K. in order to give manufacturers there what effectively amounted to a monopoly. "Millions of Indian laborers were thrown out of work," says de Waal. They and their descendants were pushed into a level of impoverishment that reached the point of starvation at various periods during the late 19th century. Then came the famines due to, as de Waal puts it, "the wars of annihilation by totalitarian regimes" in the first half of the 20th century. The Nazis weren't just determined to wipe out Jewish people. They also had a so-called "Hunger Plan." "The idea was to starve to death 30 million people in Eastern Europe — Poland, the Ukraine and the Soviet Union, people Hitler dubbed 'useless eaters' — in order to free up their land and resources for the German army and for German settlement," he says. If they had fully succeeded, "it would have been the worst atrocity of the Nazi regime." As it was, before the war's end "they had managed to starve six million people." The third and arguably most destructive category of widespread famines before 1980 were those that several Communist regimes wreaked upon their own peoples. The deadliest of these — in fact the deadliest famine on record — lasted from 1958 to 1962 as a result of Mao Zedong's infamous "Great Leap Forward" plan. In the name of accelerating China's economic development, the central government forcibly re-organized the way agriculture was produced — to devastating effect. "It directly caused a famine that killed at least 25 million people," says de Waal. So he contends it's not surprising that the abatement by 1980 of all three of these drivers — colonialism, world wars and extremist Communist economic policies — led to such a marked decline in the prevalence of famines. In fact, de Waal says, by late 2015 when he first set out to write his book, the picture seemed so rosy his focus was going to be "Can we really eliminate famine in the coming years?" At the time, he adds, "my premise was that 'Yes, we can. This is eminently achievable and we are well on track.'" As he was writing, "things turned out to be not as solved as I'd hoped. Famine came back in 2017." And yet, even as de Waal laments this backward slide, he says it's worth noting that the death toll from the food crises of the last year has been remarkably low, thanks to the increased professionalism and sophistication of aid workers, including their use of early warning systems. "If this kind of crisis had struck 50 years ago we would have been seeing many, many more people dying." Famine is not a natural disaster — it's primarily man-made. A related and, de Waal argues, equally important insight from his analysis of famines over the last 150 years, is how few of them were due to natural disasters such as drought or flooding or simply an inability of a place to produce enough food. Instead de Waal found that 70 percent of the deaths occurred in famines that were fully man-made, meaning they were created by government policies that were either recklessly incompetent (exhibit A is the Great Leap Forward) or expressly intended to starve people in the vein of the Nazi Hunger Plan. This has also been the case with most of the famines or near-famines we face today — the crisis in Yemen, for instance, is largely the result of the blockade by Saudi Arabia and the United Arab Emirates that is preventing food and other supplies from getting in. Similarly, "in Syria we see the starving of cities as a tactic of war carried out by the Assad government." Another 18 percent of the deaths were the result of the failure of authorities to address climactic conditions that created food shortages but that would have been entirely solvable through aid. Among the examples de Waal cites was the famine precipitated in Sudan in 1984, when then President Jaafar Nimeiri chose to ignore the hardship caused by drought and an economic crisis and refused to request international relief assistance. That leaves only 13 percent of deaths over this 150-year period due to famines that were caused by external factors that governments were genuinely incapable of responding to. And most of these are deep in the past — for example various famines in China and Brazil in the 1870s. Maybe you've heard of Thomas Robert Malthus and his theories about population growth and the food supply? Well, he got it wrong. And yet there's a popular perception that famines are primarily the product of natural causes. "If you google famine, you get pictures of drought," notes de Waal. Why does this misguided notion persist? De Waal says it largely dates back to the writings of the English cleric Thomas Robert Malthus, who first put pen to paper in the waning years of the 18th century. In his 1798 Essay on the Principle of Population Malthus posited that human population growth inevitably leads to famines. Essentially his argument was that humans reproduce at a much faster rate than they can increase their capacity to produce food. The consequence is that, at periodic intervals the size of the human population outruns the food supply and famine results. In other words, famine is Nature's way of culling the human population to a sustainable level. Then the cycle begins anew. The trouble with this view, says de Waal, is that history has not remotely borne it out. Our capacity for increasing food production has consistently matched and even outpaced our population growth. In fact, "in his later writings even Malthus abandoned his original views." But it was too late. The "Malthusian" notion of inevitable famine cycles had taken root both in the scholarly literature and the popular imagination. "I call it a zombie concept," says de Waal, "because it's one that scholars of agriculture and economics have continually refuted, but it still keeps coming back to life to torment the living." It torments the living, he elaborates, because the fear that it engenders about population growth has periodically led authorities to pursue policies that — paradoxically — actually did create famine. It's no coincidence, says de Waal, that Hitler was a follower of Malthus. "The Hunger Plan itself came out of that zero-sum logic. His belief was that there's only a limited amount of productive land, and therefore we Germans must grab as much as we can and the 'useless eaters' need to be exterminated." Climate change. It won't lead to famines — but our misguided response just might. De Waal is at pains to stress that climate change is real and that widespread concerns about its potential impact on agriculture — particularly in the world's poorest countries — are warranted. "It can cause crop failure, loss of livelihoods and impoverishment," he says. But he adds, "we are more than capable of stopping these problems from causing starvation. In fact if we managed things in an equitable way there's no reason why even with climate change we couldn't feed many more people than we do today. The only thing that will cause starvation is if politicians take political actions that cause people to starve." For instance de Waal is concerned about what he says has been an upswing in land grabs, especially in Africa. "Already you see investors, particularly from the Middle East and Asia but also from North America and Europe, buying up huge tracts of land in Africa because they see it as a limited resource that we better grab as much of as we can. And that's causing all sorts of problems by displacing farmers." The investors, he notes, "are thinking of this as a hedge against food shortages — but actually you're creating the problem now." In short, if there's one message de Waal is intent on driving home it's that famines are not a phenomenon that we are powerless to prevent. They are primarily of our own creation. "If you see someone starving," he says, "it's because someone has starved them."